Within you lives a mighty warrior. . . God's Holy Spirit! In this powerful teaching DVD, Joyce Meyer shows that focusing on the Spirit's indwelling presence will increase your faith and enable you to face life fearlessly. 60 minutes. 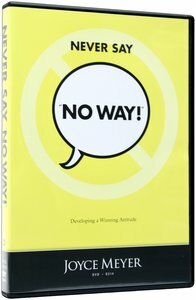 About "Never Say No Way! (1 Disc)"